Become part of the world’s largest marine equipment trade show! 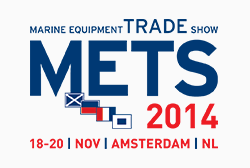 YES-yachts.com is happy to welcome you at Amsterdam RAI for this years edition of METS. Find top EU- and worldwide brands exposing the newest high tech yachting equipment – Nov 18th to Nov 20th, 2014. See the gadgets you want and your yacht still needs! We are also attending the GLOBAL SUPERYACHT FORUM 2014 (Nov 17th to Nov 19th, 2014) for you, discussing and evolving future projects together with the industries most innovative master-brains and global players. So stay tuned for the 2015 news. Call our team now at +49-176-963 963 24 to schedule one of the few remaining 1to1 VIP-assistance tickets for the show – finding the yachting gadgets of your dreams! This entry was posted in events, news and tagged 1to1 vip-assistance, Amsterdam, brokerage, charter, event, Global superyacht forum 2014, Internatinal Boat Show, Megayachts, motor yacht, Netherlands, new build, new series 2015, purchase, RAI, sale, superyacht brokers, Superyachts, yacht equipment, yachting, your personal yachting assistant. Bookmark the permalink.